Establishing your website’s identity on Google+ (and on all of Google) starts when you add a website to your Google+ Page that links your customers to the website that serves as your brand’s home base on the web. Go to your Google+ Page, and click the Profile section. 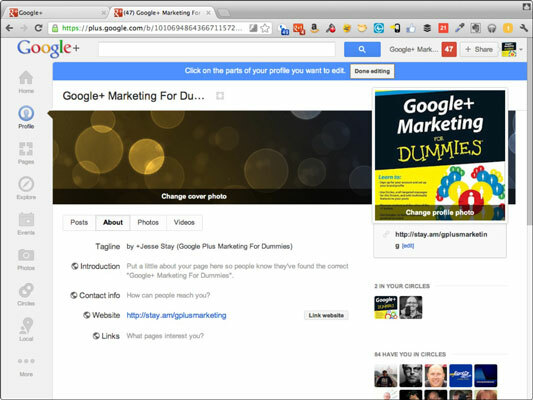 To go to your Google+ Page, just click your name in the upper-right of Google+ and select your Google+ Page. Note the list of icons (currently, at the left of the screen); click the Profile icon to open your page’s Profile section. Click the Edit Profile button at the upper-right. Edit mode opens for your Google+ profile. The website line on your profile changes to a field that you can edit, providing buttons to either Save or Cancel the changes you make to your profile. Type in the URL to your website. Enter the main URL for the website associated with your Google+ Page. This URL should lead to a strong landing page, ideally with a Google+ Page Badge on it. Your website appears on your Google+ Page, displayed prominently.